In the music world, Yamaha is one of the heavy hitters. If you were in band at school or have ever seen a live performance, chances are you have looked at a huge amount of Yamaha instruments. While we’ll be talking about the best Yamaha digital pianos out there, Yamaha also makes an almost countless number of other products—strings, marching instruments, grand pianos, guitars and basses just to name a few. In this article, we’ll be diving head first into the Yamaha product line to learn the ins and outs of what makes Yamaha such a trusted name in music. Yamaha began 1,000 years ago—alright, that’s not true, but it sure feels that way, doesn’t it? This quote is basically saying that through the passion of music we can connect with other people and enrich our lives. I couldn’t agree with this more. Never have I felt more bonded with someone than when they are playing me something on their main instrument or singing me a song that they feel emotional about. You have most likely felt this exact same connection when you went to see your favorite band live at a concert. The feeling is hard to articulate, but unequivocally present. Yamaha aims to share this primal feeling with as many people as possible. From 1900 on, Yamaha began creating acoustic pianos—initially focusing on uprights. This gives them well over a century’s worth of experience crafting pianos. The first digital piano Yamaha released was the YP-40 in 1983 which will look, feel, and sound much different than the pristine Yamaha digital pianos that you will find on the market today. Yamaha, these days, has entry-level to premium keyboards, music workstations, synthesizers, arrangers, stage pianos, and more. Yamaha is, by a good margin, the largest maker of audio gear and musical instruments—rising far above companies like Gibson, Sennheiser, Shure, and Fender. The Yamaha logo since all the way back in 1898 has been based around the tuning fork. If you didn’t realize it was a tuning fork, don’t feel bad. I played on a Yamaha trumpet and stared at the logo on my case for 5 years before I knew what it was. For those of you that aren’t familiar with them, a tuning fork is a U-shaped piece of metal with a handle. When you strike that piece of metal on a hard surface, it produces a pitch that you can tune your instrument to. Most of us now will likely use a digital tuner, but they are fun to mess around with. The first iteration of the logo showed a Chinese phoenix holding a tuning for in its mouth. The modern logo shows three tuning forks on top of each other. Yamaha Motor Co., Ltd—the sister company—uses a very similar logo. Yamaha puts the sounds on their digital pianos in multiple ways. With digital pianos, there is typically one goal in mind: create the most accurate representation of a piano possible. But, which piano? There are many to choose from—Bösendorfer, Steinway, or maybe a Yamaha (might be a good choice for them). What room should it be recorded in? A concert hall? A studio? Where a piano is recorded impacts the sound heavily. Who should play it? I wouldn’t want that kind of pressure. What microphones should be used? Neumann! Sure, which one? TLM-103? 102? U87? Maybe a Manley, AKG, or Blue microphone? After the recordings are made, should they be filtered at all? Are samples enough? Yes, you may have captured the note, but there are a ton of nuances that you may have missed. Sympathetic string resonance, for example, is nearly impossible to accurately reproduce because it depends on which notes you have held down when others are being played. Another is key-off resonance, which is the sound of the damper hitting the strings after a note is released. These are just some the questions that Yamaha—or any company creating a digital piano—have to ask themselves before doing or making anything. I’d like to walk through some of the techniques Yamaha uses to make this possible. AWM stands for Advanced Wave Memory, first used in 1986. Two microphones are used to capture the performance of a grand piano. All the notes are recorded separately with three recordings taken for each note: soft, medium, and loud. When someone hits a note on a digital piano that uses AWM, the piano determines which sample would be the most appropriate or blends a combination of two. There is also a 4-layer version of AWM that takes an additional sample. These days, AWM is typically used on the entry-level digital pianos. The progression of AWM is extensive. It first began with 1-layer mono samples that were filtered for different velocities as opposed to recording multiple samples and choosing the appropriate one. In 1990, stereo samples were used and recordings were taken of various pianos—the Yamaha S6 grand piano for example. Pure CF Sound Sampling is a newer and more advanced method of piano sound production that samples the Yamaha CFIIIS 9-foot grand piano. You can find Pure CF on intermediate digital pianos, such as the P-125, DGX-660, and YDP-143. The latest iteration of Pure CF Sound Sampling, found in the Yamaha P-125, utilizes sympathetic string and key-off resonance to more accurately capture the sound of an authentic grand piano. Samples are taken from the Yamaha CFX grand piano and the Bösendorfer Imperial (which is also owned by Yamaha). These are Yamaha’s most impressive sampling in their entire library, fitting for their fanciest pianos. 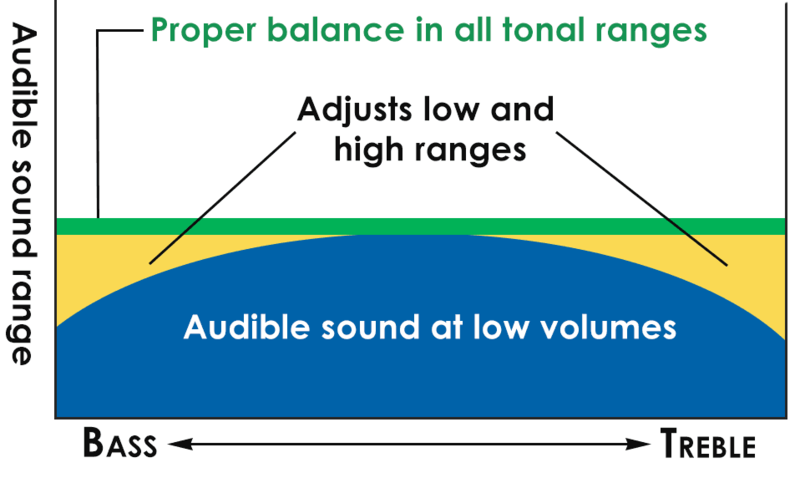 The Yamaha CFX tone is also coupled with Binaural Sampling to create three-dimensional sound so that when you are playing with headphones on, it acts as if the sound is coming from the piano rather than your headphones. This sampling technique is used in the premium models, such as the P-515, YDP-184, and all Clavinovas. In the AvantGrand series, Spatial Acoustic Sampling is used to convey realism by recording a piano in four separate locations across the soundboard. Those sounds are used in a four-point speaker setup. This technique creates the sound of a grand piano in a three-dimensional space, giving a full and rich response. The AWM2 uses waveform and subtractive synthesis to create acoustic instruments, drums, and synthesizer sounds. The FM-X, on the other hand, uses pure frequency modulation synthesis. In the Montage and MODX Series, each of these sound engines can be used separately or layered together to produce sound. Every other sound engine I have mentioned so far has had the goal to create an authentic sounding piano. That’s not the case for the AWM2 and FM-X. You won’t find them in a digital piano, but in Yamaha’s music workstations and synthesizers. The Super Knob – get creative with your sounds using the Super Knob. Go from punchy and hype to mellow and warm with a single twist. 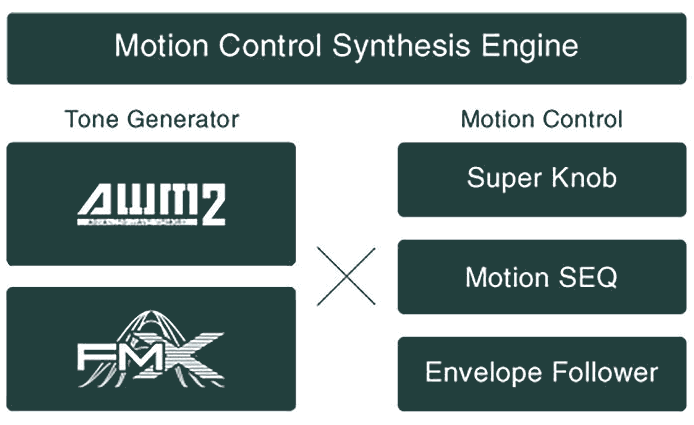 Motion Sequences – manipulate your sounds while keeping them in sync with the tempo. Yamaha has put a lot of work into making sure this sound engine offers creative freedom and bleeding edge quality. The Virtual Circuitry Modeling Effects Engine can be found on the MX series (MX49, MX61, MX88). It models many vintage sounding effects – EQs, phases, flangers, and more to twist and pull the sounds that come with those devices. Yamaha’s goal with VCM was to accurately recreate the sounds that you would get from analog processors and gear in recording studios. They did this by modeling the electronic circuitry and using it in their software—compressors and EQ, for example. These emulations are found in many of Yamaha’s products: MOTIF XS, CP series stage pianos, synthesizers, and many more. Aside from these sampling and sound engines, there are other technologies that Yamaha uses to improve the sound of their products. I’d like to cover some of those here. When playing at lower volumes, it is sometimes more difficult to hear low and high-end frequencies. Intelligent Acoustic Control compensates for this and rebalances the instrument so that you can hear its full range of frequencies at any volume. If it is late at night or early in the morning, you may want to plug some headphones into your digital piano so you don’t disturb the people around you. When you plug them in, nothing special happens—it just sounds like a piano in some headphones. Yamaha’s Stereophonic Optimizer adjusts the sound of the piano to sound more spacious as if you are in a room listening to the piano, rather than wearing headphones. Playing piano with a band can be difficult because you are oftentimes competing with extremely loud instruments—guitars, drums, etc. Yamaha’s Sound Boost can help by making your piano louder and increasing its presence to help you find your place in a mix. This feature is effective on both the onboard speakers and if your digital piano is connected to an external setup. The way speakers are built into the body of the digital piano will cause some frequencies to ring louder than others due to the body itself resonating. Yamaha’s Acoustic Optimizer counteracts this effect to provide a smooth playing experience across all the keys. The subtle nuances and quirks of an acoustic piano are terribly difficult to recreate. VRM steps in to save the day, turning the dull and digital sound into a lively, organic experience. A grand piano makes sound by hammers hitting strings. What makes them ring out so beautifully is the huge body of the piano. 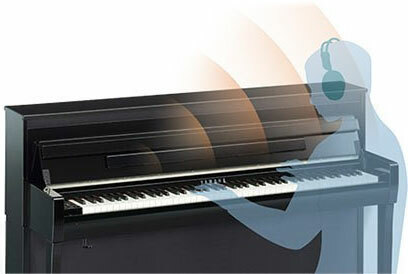 On a digital piano, we don’t have this body to resonate our sounds, so Yamaha came up with a solution. The Virtual Resonance Modeling inside the higher-end Yamaha digital pianos simulates the sound of a note resonating in the body of a grand piano. It also takes into account how the notes would resonate in different octaves to stay true to a grand piano. Using VRM, each string has multiple states for different situations like for velocity and pedals that drastically affect the sound. A digital piano’s key action is largely responsible for why you would love or hate the feel of a Yamaha digital piano (or any digital piano really). Before we get into the different types of key actions that Yamaha uses, I would first like to discuss what a “key action” is exactly. 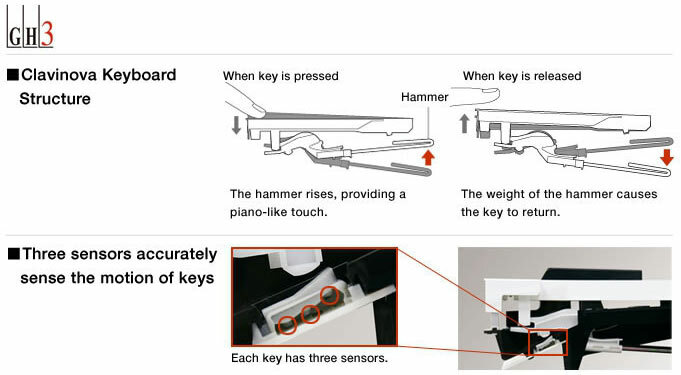 In the most basic sense, key action is what a key on a digital piano is doing when it is pressed and when it is released. A grand piano has strings and when a key is pressed, a hammer strikes one or more of those strings. The string then resonates in the body of the piano so we can hear it. On a digital piano, we don’t have strings or hammers or a body, but when we play we want to feel like all of those things are happening. The perfect key action on a digital piano would be indistinguishable from an acoustic grand piano. The trouble for companies like Yamaha is that not all grand pianos feel the same way when you play them, making it difficult to determine exactly what it should feel like. Another issue is with the player—not every player will like the same key action. For example, someone who plays aggressive on the keys might find a better playing experience if the keys felt a bit more heavy while a more delicate player may feel the exact opposite. Most of Yamaha’s synthesizers use the FSX action. This action is not weighted and designed to be extremely fast and responsive. Some of Yamaha’s entry-level or beginner friendly keyboards (YPG-535, NP-12, NP-32) will be using Graded Soft Touch. This spring-loaded action will have some resistance to it in order to feel more like an acoustic piano. The Graded Soft Touch has no hammer mechanisms or weights. It’s heavier on the lower notes and lighter on the higher notes to roughly simulate an acoustic piano. Semi-weighted actions may have full-size keys and a keyboard that looks exactly like the one found on acoustic and digital pianos but don’t be tricked by its looks, it’s still miles away from a real piano as far as feel is concerned. Fully-weighted key actions are designed to mimic the feel of an acoustic piano as closely as possible, but not all hammer action keys are created equal. While the lower-end actions will feel clunky and unrealistic, the higher-end will be insanely close to that of a real piano. Yamaha has more than one type of fully-weighted key action that range in quality. The Balanced Hammer Effect Keyboard is a non-graded hammer action which means that all the keys have the same resistance, rather than needing more and less force on the lower and higher keys, respectively. This type of action is used on the Montage8 synth workstation. Not very sophisticated compared to their piano-focused key actions, which are graded, but still reproduces the weighted nature of an acoustic piano action. Graded Hammer Standard. This type of action is typically found on beginner and intermediate digital pianos—aimed at aspiring piano players. The lower keys will have more resistance than the higher keys, similar to an acoustic piano. Yamaha digital pianos under $1500 will most likely have this type of action. The GHS keyboard features a matte finish on the black keys which makes your fingers less likely to slip off of the keys. GHS has been around for many years and Yamaha still stands behind the action, showing off its reliability. This action has two sensors, as opposed to three that are found on the more premium actions. Three sensors allows more accuracy in the behavior of the piano, quick repetition of notes, and expression. Graded Hammer/Graded Hammer 3. Compared to the GHS, these are more true to what an actual acoustic piano would feel like. They will be heavier with more resistance. You can find this type of key action on the YDP-164, YDP-184, YDP-S54, and the 500 series Clavinovas. The main difference between GH and GH3 is the third sensor which offers all the benefits found above. GH3 also has synthetic ivory tops to give the player a more tactile experience. Graded Hammer 3X. This is the newer iteration of the GH3 that includes an escapement mechanism which is a feature found on grand pianos that allows the note to be repeated quickly before the action returns to its resting position. Since digital pianos don’t have strings, escapement action doesn’t really serve any purpose except to reproduce a subtle clicking sensation felt when you gently press a key. The GH3X key action is used on the lower end Clavinova digital pianos (CLP-625, CLP-635). Natural Wood-Graded Hammer. This is Yamaha’s older wooden action used in the CP4. It does not have the escapement mechanism and has three sensors. Natural Wood X. The newer wooden action used in the CLP-545+ (CLP-645+), CSP-170, and CVP-705+. Just like the GH3X, the NWX has the escapement mechanism causing you to feel a “click” when the keys are played softly – more noticeable in the higher register. Despite having a lot of similarities with the GH/GH3 family, the NWX is slightly better balanced and more responsive, which, coupled with the wooden keys, provides a more natural feel. This is a flagship wooden action used in the higher end Clavinovas (CLP-675+). 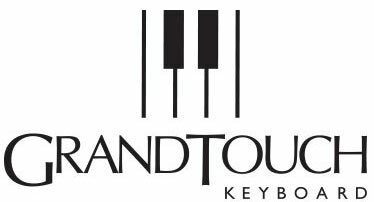 The goal of GrandTouch was to replicate the resistance and feel of a grand piano with as much accuracy as possible. This offers the player a responsive and heavily dynamic experience with huge amounts of control when playing very soft or loud. You also get much longer keys (including the hidden part). This makes it very easy to play further up the keys, which is an important characteristic that experienced pianists will appreciate. Many people confuse keyboards with digital pianos because they share a lot of common traits, but there are some notable differences. A keyboard will typically have semi-weighted or synth-type action that is not designed to give you the feel of playing on an acoustic grand piano. It’s also rare to find a keyboard with 88 keys (which is what an acoustic piano has). Most keyboards will have 61, 73, or 76 keys. Keyboards have a bit more shock and awe in terms of their feature set when compared to digital pianos. When I was growing up, we had a portable keyboard in our play room that could teach you songs with light up keys, play accompaniments while you sing, and came loaded with hundreds of instrument voices to use. None of them sounded realistic though—I remember the trumpet setting sounding more like my family dog biting a chew toy than an actual brass instrument. Keyboards are closer to a fun machine that beginners or kids can play on to figure out if they may want to play piano in the future. Portable keyboards are by far the cheapest product in this lineup. The most affordable Yamaha portable keyboards you can buy. These keyboards are ideal for kids, new piano players, or people who are not really sure if they want to become a piano player that need a low cost option. The use of the PRS-E Series is similar to the YPT & EZ Series in that it is a device to explore music as a whole, not necessarily just piano. The PSR-E series can be used as a portable arranger—having the ability to create a beat, tweak a mix, and get full songs created. This series includes an onboard lesson function to teach the student music as an educational tool. The flagship model (Yamaha PSR-EW410) has the ability to capture external sounds using a sampler. The Piaggero Series is aimed toward piano players while the previous ones were more geared to learning and entertainment. Piaggero keyboards have far fewer tones to play with, less bells and whistles, and a much more streamlined appearance. Even though the Piaggero Series is for piano players, it does not have fully-weighted key action and lacks the 88 keys of a full-sized piano. So if realistic piano feel is important to you, the NP keyboards aren’t going to impress you. At the same time, these are extremely portable and can run on batteries, which can be very helpful for players on the go. We are now moving away from the portable keyboards and moving on toward the portable digital pianos. The main difference between the two is that digital pianos will have fully-weighted hammer action, which will be much closer to the feel of an acoustic piano. Portable digital pianos, also called slab pianos, typically do not come with a furniture-style cabinet to turn the whole thing into one unit. The entire product is the keyboard itself, similar to the portable keyboards we discussed earlier. If you are looking to get a Yamaha digital piano, this is where you will start. The P-45 is Yamaha’s most affordable digital piano with fully-weighted keys. These digital pianos are spartan in nature—no frills, no learning tools, no samplers. It’s simply a digital piano that tries to emulate the feeling of an acoustic piano as best as it can. These digital pianos will fit well in places with limited space. The Portable Grand series is similar to the P Series in that it is piano-focused, but with some additional features – recording functions, auto accompaniment, present songs, connectivity options, etc. With those extra features, the Portable Grand series will have some overlap with arrangers. It’s important to note that the YPG Series does not have fully-weighted hammer action, even though it will look similar to digital pianos that do. When looking for Console Digital Pianos, expect it to look a bit like furniture, especially when you get to the higher-end models. Some of these will have fancy cabinets that may contain speakers to push more sound out into the space you are playing in. Lower end models will have many similarities to the portable digital pianos we looked at earlier. The Arius Series is targeted toward the same people that would be interested in the P Series—affordable, yet high quality digital pianos. These console digital pianos will have no frills and focus on sounding like an acoustic grand piano. The YDP pianos will have a full sized cabinet, while the YDP-S pianos will be slim with a more space efficient design. Premium home digital pianos for players that are searching for the most realistic and natural piano playing experience. The key action in the Clavinova digital pianos is more advanced than what you will find in the Arius Series. You will also discover that the samples are better and the cabinets are much fancier. Recently, the Clavinova Series added the CSP (Clavinova Smart Piano) digital pianos. The concept is that the piano itself has no buttons or controls – every setting can be adjusted using the Smart Pianist App available for both iOS and Android. CSP digital pianos also have a lot of extra features that digital pianos usually don’t have such as hundreds of tones, accompaniment styles, built-in songs, etc. Another feature of the CSP Series pianos is unique teaching feature that will teach you how to play songs using stream lights technology, which shows the exact keys you need to press. This is probably the closest—and most expensive—you will get to a grand piano without actually having a grand piano. The AvantGrand doesn’t try to emulate the hammer action on an acoustic grand piano because it actually has hammer action keys. The natural vibration that comes off of a grand piano will be felt when playing the AvantGrand. Its design is almost identical to the action of a grand piano. The AvantGrant Series gives you access to Spatial Acoustic Sampling, which offers the sound of the Yamaha CFX and Bösendorfer Imperial grand pianos captured from four different mic positions and delivered via multi-speaker sound system to ensure the immersive playing experience. One key feature, or lack thereof, is that stage pianos won’t have onboard speakers because when performing on stage there will (or should) be external speakers for you to connect to. Many of the features you will find on a stage piano will be things that you can quickly change during a live performance. You’ll find extra ports/jacks to connect to multiple devices. Because there are no speakers on stage pianos, they will be fairly lightweight and portable. There is a blurry line between stage pianos, digital pianos, and synthesizers as all of them can be used for gigging pretty reasonably. The CP instruments will have a large selection of quality sounds from various eras to fit whatever style you’re playing. The CP Series emphasizes portability and ease of use. Yamaha recently introduced the CP73 and CP88 giving a lot of new features to an old lineup—NW-GH3 with synthetic ebony and ivory key tops, brand new sounds, and additional ports/jacks, to name a few. Now we’re moving away from piano-focused instruments and entering sound design, music production, etc. Using a synthesizer, you will be able to craft a sound from nothing using a series of knobs, sliders, and buttons. Similar to the stage pianos, you likely won’t find speakers on any of these synthesizers. The need for a realistic feeling of playing an acoustic piano is very low in this category. The MX Series synthesizers use sounds from the Yamaha Motif XS—pianos, strings, drums, and complex synth sounds. Bring these sounds into your DAW using a MIDI interface and monitor everything by connecting your headphones to your MX Series device. With an iOS device, you get access FM Essential which lets you twist and pull your sounds in crazy ways. Despite being a synthesizer, the flagship model, MX88, will also feature the Graded Hammer Standard (GHS) action, making it much more suitable for piano players. I can easily see these instruments used as stage pianos or in studios. The Reface series offers four different synthesizers that each have an incredible amount of sounds to create. Each model targets a different kind of sound—the Reface CP for example gives you the ability to create 70s stage keyboards. These instruments are very portable yet have a lot of potential when it comes to sound shaping. The Montage and MODX Series synthesizers are supercharged versions of the entry-level synthesizers. These synthesizer workstations give you more control over your sound and freedom to dive deeper into what sound you want to create. An interesting feature of this series is that they are platform-focused meaning that Yamaha frequently sends out updates to improve the devices over time. The Montage8 Series has a Balanced (non-graded) Hammer Effect Keyboard while the others have FSX action. The MODX8 has fully-weighted keys (GHS), while others are semi-weighted. All of these instruments feature a big multi-touch screen which makes navigation much easier considering how many settings, sounds, and functions they offer. While synthesizers are perfect for people creating wild sounds, arrangers are more useful to songwriters, composers, and solo performers that need full accompaniments. You don’t have as much control over your sound, but you do gain the ability to sound like a full band all by yourself. With workstations, there is a lot of work you can do before you have to switch to your computer or another device. Editing, mixing, recording, and performing can all be accomplished on a workstation—these are very powerful machines. The flagship workstation from Yamaha. The samples on the Genos are far and above in terms of quality—giving you access to the Yamaha CFX and C7 Grand pianos, for example. AEM (Articulation Element Model) is used to give realistic sound of whatever instrument you are playing. It does this by choosing the best samples based on the styles you are playing in. Everything you need to put together a great song can be accomplished on this powerful workstation, even vocal recording and effects. The PSR Series excels in a specific area—reproducing the subtle nuances and quirks of instruments. This includes vibrato, brass falls, guitar and bass slides, and much more. In order to control all of these different elements, the PSR series includes assignable live controllers, a modulation wheel, and assignable foot pedals. This gives you the ability to not only control many things at once, it lets you do them in a live setting as well. With onboard storage, you are able to add expansion packs to get more sounds or use that space to create your own. Composers and songwriters will benefit greatly when creating on the PSR Series. Being able to craft accompaniments, use arpeggio functioning, and other arranging tools will make writing a great song much more streamlined. This arranger is also equipped with onboard speakers unlike most of the products in this category. Yamaha has a long history of creating great equipment for sound designers, piano players, composers, and many others. If you have a specific musical need, chances are Yamaha has the perfect tool for you to use – you just have to go out and find it. If you have any personal experiences with Yamaha digital pianos or keyboards, feel free to let us know in the comments. If you liked the article, feel free to share it around. Cool overview and history of Yamaha products, that was an entertaining read! Would you cover other brands like Korg, Nord, Roland etc with this treatment too?